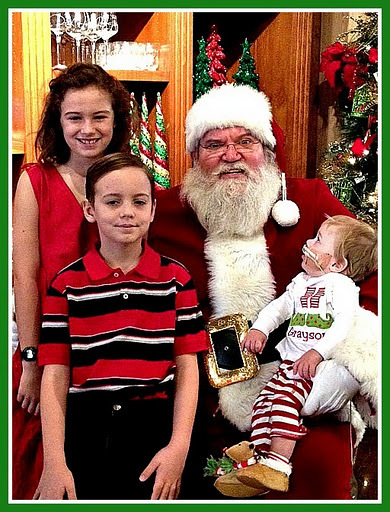 This morning, Grayson was one lucky little elf who got to have breakfast with Santa, his cousins Quincey and Cooper, Aunt Brittany, Dear, and Mommy and Daddy. Daddy wasn’t too thrilled with Grayson’s outfit, but I LOVE it. He’ll only be a baby once, and can wear polo shirts the rest of his life right? Try putting a 10 year old in a personalized applique shirt, candy cane pants, and reindeer slippers. Grayson (who has ZERO separation anxiety) happily went to Santa and was mesmerized by his white beard. The breakfast was held at Brookwood Community, which has the most delicious food and incredible gift shop imaginable. A Christmas wonderland. It was such a fun morning outing and sweet G was tuckered out when we got home and has been asleep ever since. Thank you Dear for such a fun Christmas treat! So much fun! Glad you had a great time, love his outfit and cute pic!